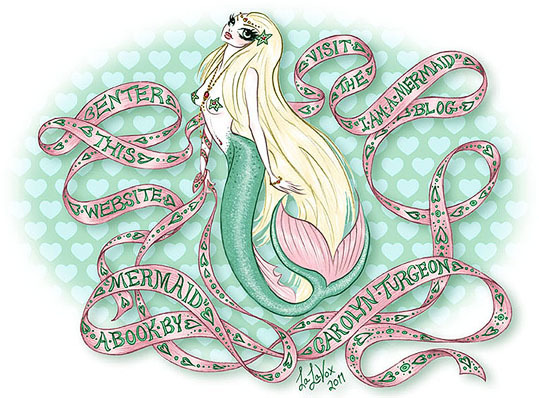 Extra Goody #7 - "Mildred Presents: Lenia - from Carolyn Turgeon's book MERMAID - as a rub-on-tattoo design"
Lenia will be available as a limited edition rub-on tattoo tucked in between the covers of Carolyn's Turgeon's book MERMAID, which will be going on sale in March of this year! I was delighted when Carolyn asked me to design it for her! 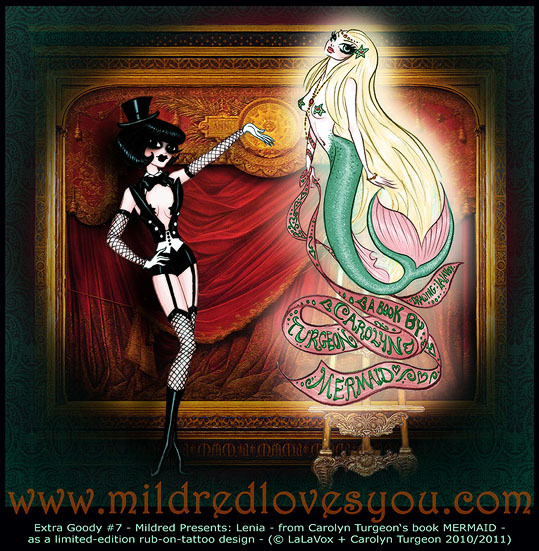 It's also fun for me to know that the artist responsible for another book-promo goody for MERMAID is none other than the legendary Easy-Bake Coven palmist, illustrator, and musician Dame Darcy herself! I well remember my first encounter with the Dame's work - long ago - in a back corner of the comic book store Grober Unfug here in Berlin. I was fascinated by the dark and scratchy interiors of her comic book MEATCAKE, and was astounded and impressed with their fearless celebration of all things ornate, girlie, and darkly Victorian. 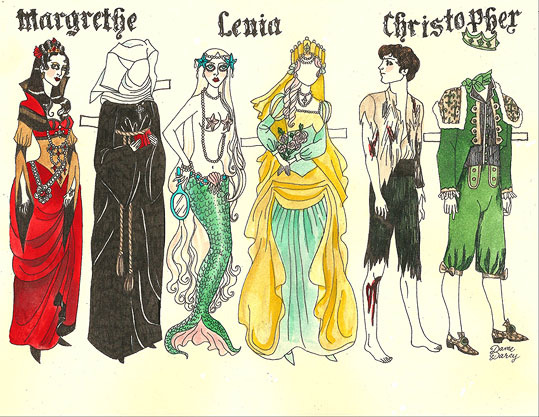 And here is the splash-page version I did for the entry to Carolyn Turgeon's website. I'm assuming this splash-page will stay there until such time as her next book is released (upon which a new splash-page with the theme of her new book will become necessary of course). And of course: HAPPY NEW YEAR! - and all the best to all of you in 2011! 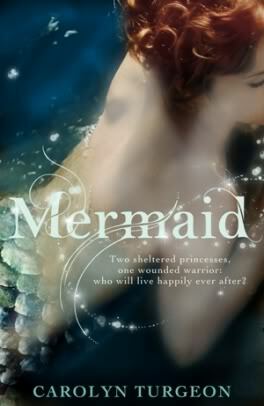 It looks as though 2011 will be The Year of the Mermaid - at least in Carolyn's Turgeon's corner of the world. 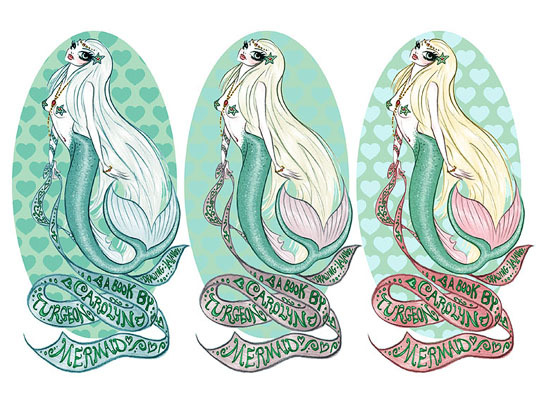 She has created a blog called "I Am A Mermaid" and has declared her intention to post something mermaidy there regularly all through the year of 2011. Let us all wish her well in this endeavor! She has collected all sorts of delights to shower us with: interviews with multitudes of professional mermaids, mermaid legends and trivia, and assorted other goodies - from all over the world - including an interview with our very own Lorelei Vanora! "Just because you're half a fish doesn't mean you have half a heart."